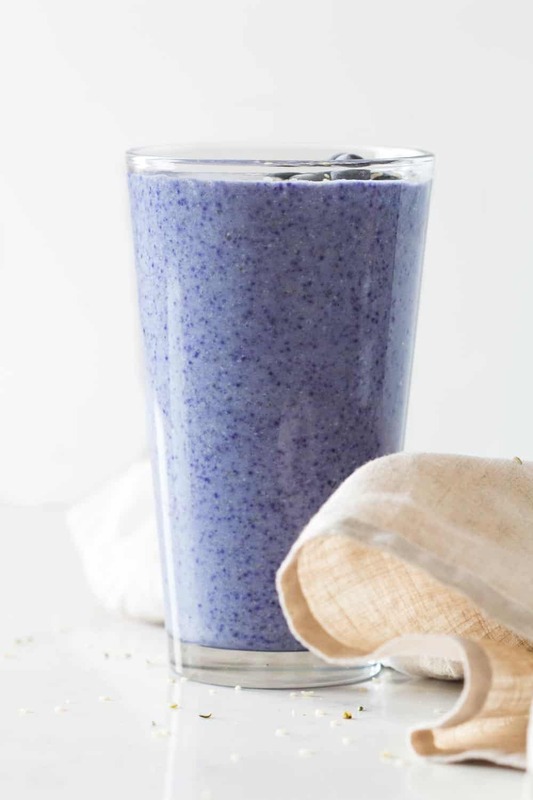 A Blue Smoothie made with Butterfly Pea Tea Powder. 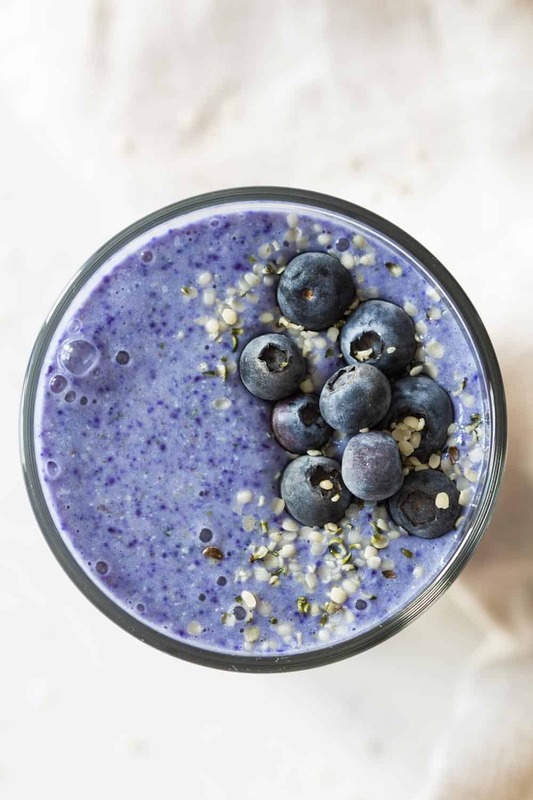 Yummy bananas, nutritious hemp seeds, almond milk and tea powder is all you need for this amazing blue-colored smoothie! I have experimented like a crazy girl for this recipe and failed SO many times it’s ridiculous. First attempt: cooked then frozen cauliflower. That was so gross I had to pour it down the drain. Ewww. Second attempt: raw cauliflower. Um, a bit better in taste but the consistency is awful! Don’t do it! You may ask why I insisted with the cauliflower. Well, since the blue smoothie is supposed to be super blue, I didn’t want to add colorful fruits and vegetables. I tried to include only white stuff. Banana, almond milk….cauliflower. Naturally, right? 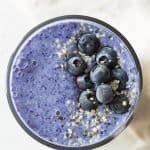 What Is The Best Natural Food Color for a Blue Smoothie? I’ve been wanting to make a blue smoothie for ever. I searched the internet for tips on how to naturally achieve a strong blue. And there are three options form what I understand. Blue Spirulina and Chlorella which are blue-green algae. They are superfoods and super nutritious, unfortunately very stinky though in my opinion. Um, and a bit yucky. Ugh. Red Cabbage Juice mixed with baking soda. This is something I toooootally want to try with my kids some time as a science experiment. You cook red cabbage in water for a very long time, strain the purple water, add baking soda and watch the magic. BLUE WATER! *boom*. Disadvantage: it needs quite some time to prepare. 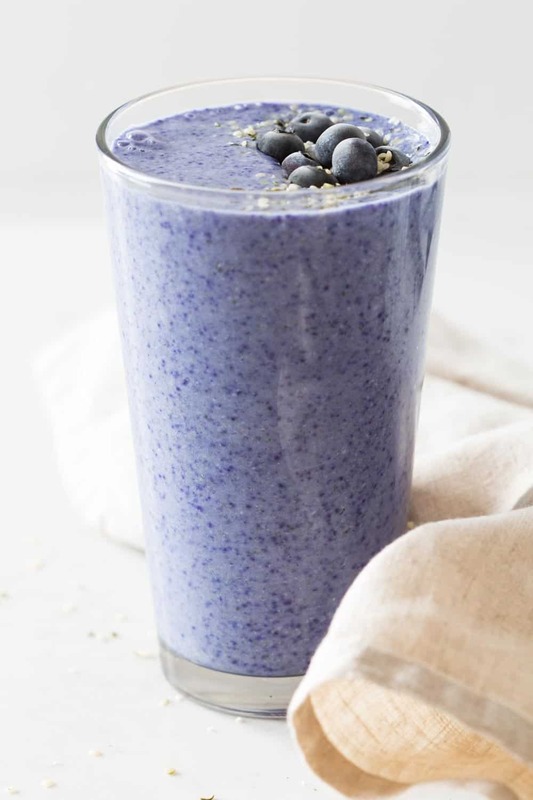 Should This Blue Smoothie be a staple? No. I loved to experiment with this. Loads of fails as I mentioned above but then finally success. Nonetheless, this smoothie will not become a staple in my house. 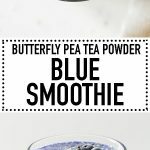 For one, butterfly pea tea power * is: e-x-p-e-n-s-i-v-e! You don’t need that much for a tall glass of smoothie, 1-3 teaspoons only. However, at 20 bucks for 100g (3.5 oz) I find this incredibly expensive. Another reason this won’t become a staple is because I couldn’t make this smoothie ultra nutritious. The whole point of drinking smoothies is to nurture your body. For the smoothie to really pop out you need to use all colorless or white ingredients though. Only that way the blue will be really blue. That left me with using only water or ice cubs, milk, bananas, hemp seeds and cauliflower. I tried to add cauliflower but ewwww. If you are looking for a super nutritious smoothie check out this green smoothie. It is definitely FUN though to make this smoothie. My kids loved their “smurf smoothie” and so did I. Cheers! Add all ingredients to high speed blender and then serve.